My work as a member of the Submarine Volcanism group involves research of mid-ocean ridge processes on the Juan de Fuca Ridge and northern East Pacific Rise, and the submarine geology of the Hawaiian Islands. 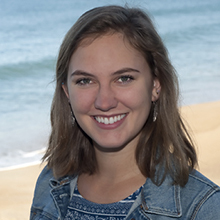 My primary responsibilities include processing and archiving geologic samples, focusing on rare igneous seafloor specimens, as well as participating in research expeditions to Axial Seamount, Hawaii’s Loihi Seamount, and Kilauea Volcano’s East Rift. I graduated from UC Santa Cruz with a Bachelor of Science degree in Earth Sciences. In addition to my studies, I built temperature and turbidity sensor cables for the international subglacial Antarctic research project WISSARD.